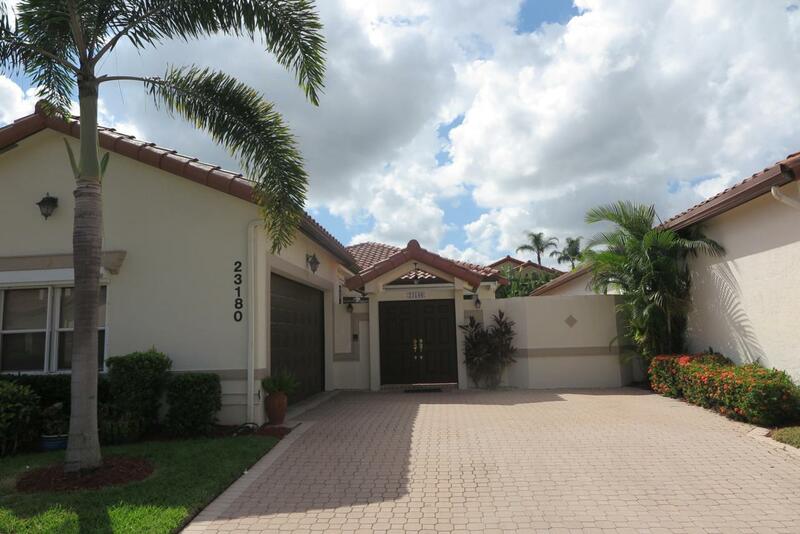 Popular courtyard pool home now available in Villa Del sol in Boca Pointe! Enter through the courtyard to this one story single family pool home. Floor plan features two bedrooms plus den or convert to third bedroom. Extra light and bright with high ceilings in all living areas with added lighting and smooth finish ceilings. Kitchen updated with granite counters, stainless steel appliances, french door frig. Kitchen wall opened up to dining and living room. Laminate floors through out. Huge windows looking out to courtyard pool and patio area. Heated pool and patio area recently redone. Electric hurricane shutters. Electric fireplace in den. Large master bedroom with walk in closet with custom built ins. Washer and dryer replaced. Community pool. Membership optional.